​Would you like to listen to bats on your evening walk or nature hike? Then the Batseeker 4 is the gadget for you! Perfect for budding scientists, nature enthusiasts, conservationists, and educators, the Batseeker 4 can be ordered by clicking on the Buy Now button (US $44.99, with free worldwide shipping) at the bottom of this page or from Amazon.com. For a review of the Batseeker 4, see Al Milano's Bat Detector Reviews. ​The Batseeker 4 lets you hear ultrasonic bat calls during evening flight and feeding activity. State-of-the-art digital frequency division technology makes the Batseeker 4 easy to use, requiring no tuning. It simultaneously covers the entire sound frequency range (20-100kHz) of most species of bats, as well as rodents and certain insects. The highly sensitive Batseeker 4 is based on a precision MEMS silicon microphone with a high signal-to-noise ratio. It samples bat calls every 1.1 milliseconds, with a sample frequency of 400kHz and a resolution of 3kHZ. You can record bat sounds directly from the built-in speaker or from the audio jack using a 4 conductor 3.5mm male-to-male audio patch cable to connect it to a computer or smart phone with an OMTP audio jack or CTIA-to-OMTP adapter. The Batseeker 4 also works with stereo headphones or earbuds. The compact portable design of the Batseeker 4 allows it to easily fit in your pocket. Two standard AAA batteries are required (not included; Batseeker recommends environmentally friendly Sanyo eneloop low-discharge NiMH batteries). A pair of 750mAh AAA batteries will last for several hours of continuous use on a single charge. The Batseeker 4 digitally filters out the low-frequency sounds picked up by the sensitive silicon microphone and divides the remaining ultrasonic component by 10, right into the audible range for humans. 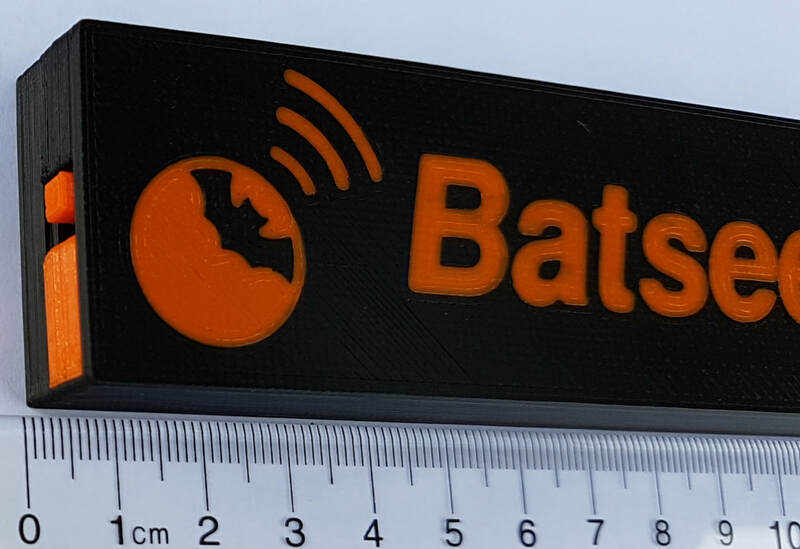 The Batseeker 4 uses advanced digital signal processing to restore the incoming signal strength in the audible signal output, so that nearby bats sound louder than distant bats. The advantage of frequency division over heterodyne conversion is that there is no static and no tuning is required: you will never miss a bat call by being tuned to the wrong frequency! * Lets you hear ultrasonic bat echolocation calls during flight and feeding! * Ideal for educators, nature enthusiasts, and growing scientists. * Explore the amazing world of ultrasonic sound. Hear ultrasonic sounds emitted by bats, rats, pollinating bees, jingling keys, a pin dropping, crumpling aluminum foil, tearing paper, rubbing fabric, popping bubbles, running water, LED and fluorescent lights, and computers. * Easy to carry and use: no tuning is required. * An upgrade to the popular Batseeker 3, the Batseeker 4 is much louder, with an internal speaker amplifier and volume controls. * Manufactured with environmentally friendly RoHS-compliant lead-free parts and solder. * PVB/PETG case tolerates temperatures up to 70C (160F). ​* Ships in biodegradeable packaging. * The Batseeker 4 comes with a 90 day full-refund warranty (from purchase date). Batseeker Logo by www.batseeker.com is licensed under a Creative Commons Attribution-NonCommercial-NoDerivatives 4.0 International License.